Sitar is perhaps the most well known of the Indian instruments. Artists such as Ravi Shankar have popularized this instrument around the world. Sitar is a long necked instrument with an interesting construction. It has a varying number of strings but 17 is usual. It has three to four playing strings and three to four drone strings. The approach to tuning is somewhat similar to other Indian stringed instruments. These strings are plucked with a wire finger plectrum called mizrab. There are also a series of sympathetic strings lying under the frets. These strings are almost never played but they vibrate whenever the corresponding note is sounded. The frets are metal rods which have been bent into crescents. The main resonator is usually made of a gourd and there is sometimes an additional resonator attached to the neck. Sitar is used in a variety of genre. It is played in north Indian classical music (Hindustani Sangeet), film music, and western fusion music. It is not commonly found in south Indian classical performances or folk music. There are a number of options in tuning the sitar. Even the same instrument will be tuned differently from piece to piece, according to the requirements of the rag. for more information check out "Tuning the Sitar". The technique of the sitar is very involved. It is certainly advisable to have a teacher. However a good introduction to the basic technique is to be found in "Learning the Sitar". The craft of making sitars is also very involved. It is certainly much more involved than can be covered on a webpage, however for a general overview, check out "Making the Sitar". 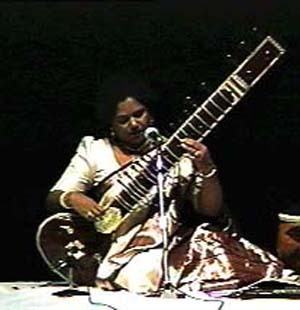 Check out a very active forum to discuss various aspects of the sitar. Go to "The Sitar Forum"